Sometimes, it's fun to make handwriting practice a little bit different. This magnetic letter activity was a fun way to work on letter identification and letter formation in handwriting. My preschooler and Kindergartner are practicing letter formation. Preschoolers can use this activity to work on writing upper case letters and kindergarten-aged students can work on lower case letters with this activity. Extend this play to older kids by asking them to write words using the magnetic letters. And, I have to tell you that using a spoon in handwriting is always a hit with kids of any age! We have a bin full of magnetic letters from over the years. 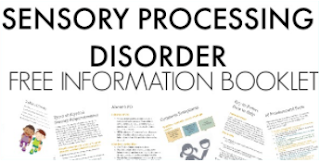 I used a set like this in my school-based OT activities and magnetic letters have always been on our refrigerator starting when when my 8 year old was a toddler. 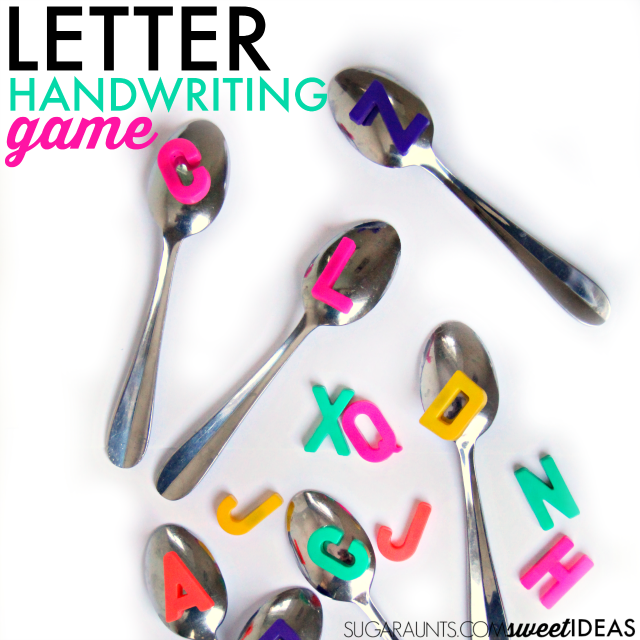 To play this handwriting game, fill a small bin or bowl with magnetic letters. 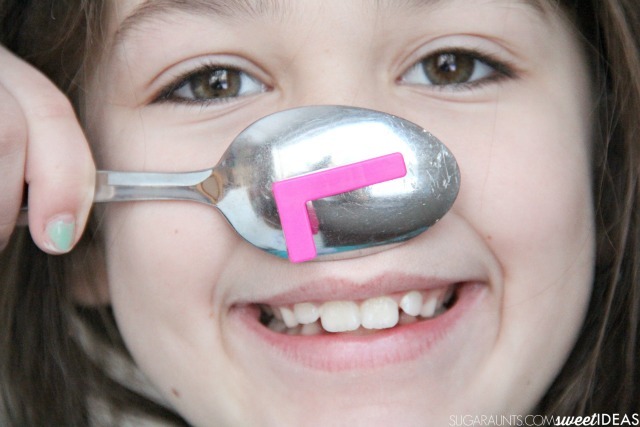 This brand worked well with our spoons activity because they were lighter. A magnetic letter like Melissa & Doug magnets worked, but they were just a bit too heavy to stick to our spoons. 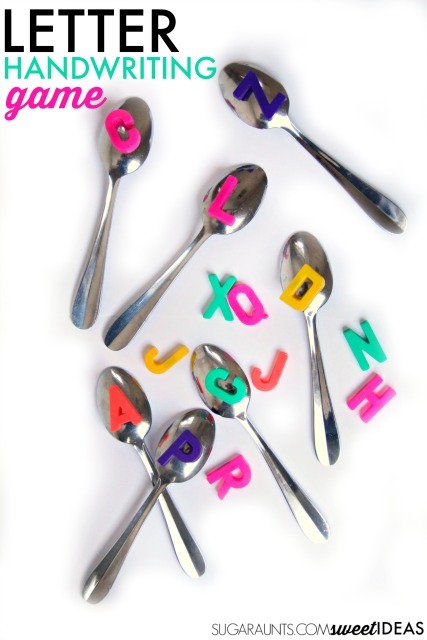 We have a few sets of dollar store magnetic letters that worked well with our spoons, too. I pulled out a few of our spoons. Now, I wish I could tell you the brand and metal make-up of our spoons, but they are 12 years old and I have no clue about that info. Apparently some stainless steel spoons are magnetic and others are not depending on the processing the metal has undergone. 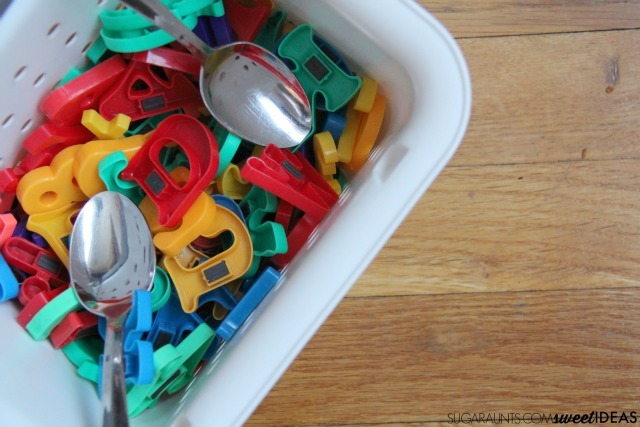 You could try a few different utensils in your house with this activity, like ladles or serving spoons. If none of these options work for holding the magnets, simply use a magnetic wand . I had my kids take turns stirring the letters with their spoons. They pulled out their spoon one at a time and looked at the letter they grabbed. I had them tell me the name of the letter and then practice writing it. This was a hit with all of the ages! There is just something about spoons that are hilarious! 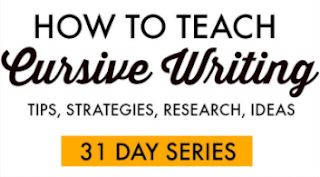 Practicing writing was fun with this activity! 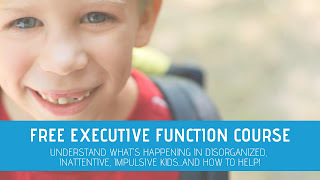 Extend the activity by having older kids write words using the letters. 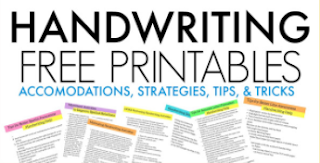 Children who are working on cursive letters can form the cursive or even upper case cursive version of the magnetic letter they pull from the bin. 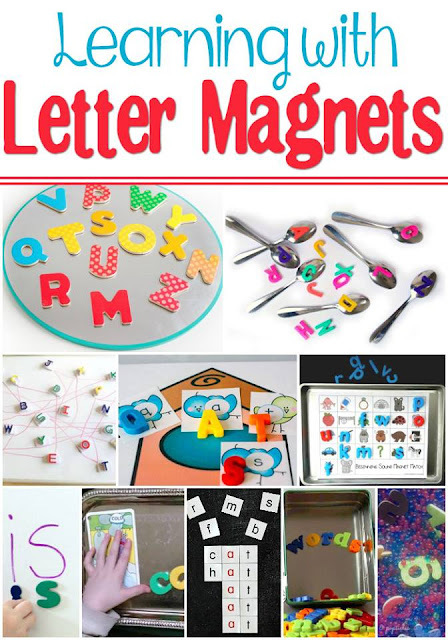 Have kids write the lower case letter of the magnetic letter. Love this? Share it on Facebook!